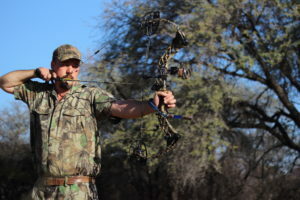 While you are waiting for the hunting season to open again in South Africa, it is a great time for you to practice all the different bow shooting positions. This will prepare you for any situation in the African bushveld, while sitting in a tree stand or even being in a blind. Here are some shooting positions for you to practice to make yourself the amazing marksman that you are. Most people practice shooting from a standing position. But you need to consider some different aspects. Here at Matlabas Game Hunters some of our blinds are from a higher perspective, so try to shoot aiming downwards. It might also be a little trickier for you to get your stance ready without making a noise, so try standing with your feet together. Some blinds and tree stands may make it a bit difficult for you to do a full draw, without touching the other side of the blind, so make sure you can pull back without a lot of room. Shooting from a sitting position sounds very relaxing, but it has its own troubles; as you do not have your legs and feet to guide and help you, and your back muscles need to work extra hard to ensure you can do a full draw to make your shot. This can also be a bit tricky from a blind, as the window you are shooting out of can be very narrow and a bit high. The seated position can be done from a tree stand or from one of our pop-up blinds. Practice this while sitting in a lawn chair, a block or even a bucket; anything to help get you your advantage of that shot. This can also help you ensure that you make the shot as quiet as possible, as you really don’t want to give away your position while your prized quarry just came in. You might find yourself crouching down a little when your animal comes in, so please practice shooting in a crouching position. This can help you get that shot around a pesky branch or something that could be blocking your shot. This shooting position will push your boundaries with balance, but we promise that it will make you a better hunter and marksman for doing this. We also recommend that you shoot with your intended camo clothing on, as you will be able to feel the movement that you have while you draw back on your bow. You will be able to realise if it is noisy or restrictive and these things can be changed and fixed before your next African safari. In conclusion, we just want to ensure that our hunters are familiar with anything that life or the African bush can throw at them while sitting in a blind or tree stand; as we want them to be able to be calm and collected while making a difficult shot when necessary.